Another one of my favorite dishes to make. I love my pasta in a rich creamy alfredo sauce. This sauce is wonderful and I use it with different types of pasta. I might add shrimp and linguini or Italian sausage and penne pasta. I like to change it up from time to time for a whole new look and taste. This time I used chicken and rotini pasta. It is delish! Don't forget to click on the photo for drool mode! Boil pasta as directed and drain well. Return to pot but off the heat just to absorb excess liquid. Melt butter in a medium saucepan over medium-low heat. Add the garlic, cream, white pepper and bring the mixture to a simmer. Stir often. Add parmesan cheese and simmer the sauce for 8-10 minutes or until the sauce has thickened and become smooth. Add the mozzarella cheese and cook until smooth. 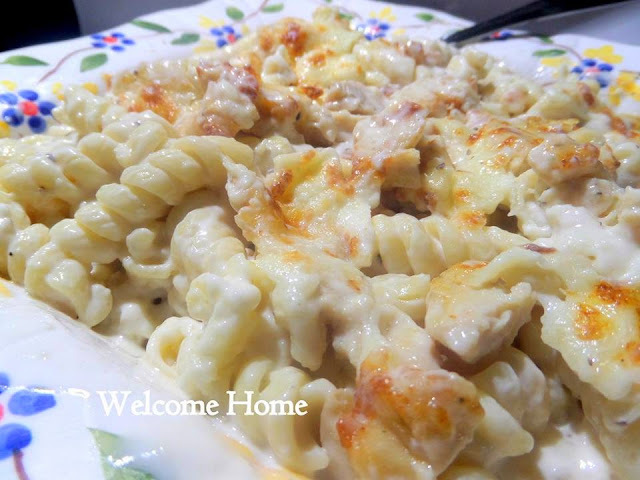 Combine chicken with the cooked pasta, and 1 cup of mozzarella cheese. Stir in alfredo sauce. Pour the mixture into a 9 x 13 casserole dish. Mix together the 1/2 cup of parmesan and the 2-3 cups of mozzarella cheese. Cover top of casserole with the cheese mix and bake in the oven at 350 degrees for 25-30 minutes or until cheese has melted and starting to brown. Just enjoyed this for our Valentine's day dinner! !